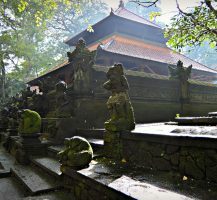 Ubud is the cultural hub of Bali. 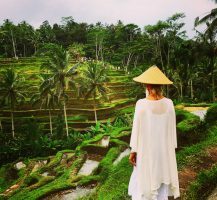 Surrounded by verdant, undulating rice terraces, tropical rain forests, ancient temples and holy sites, Ubud is the center of traditional arts and dance in Bali, the creative epicenter and a jungle paradise. 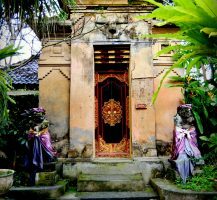 Bali is one island in the Indonesian archipelago of roughly 15,000 islands (depending on which organization you ask). 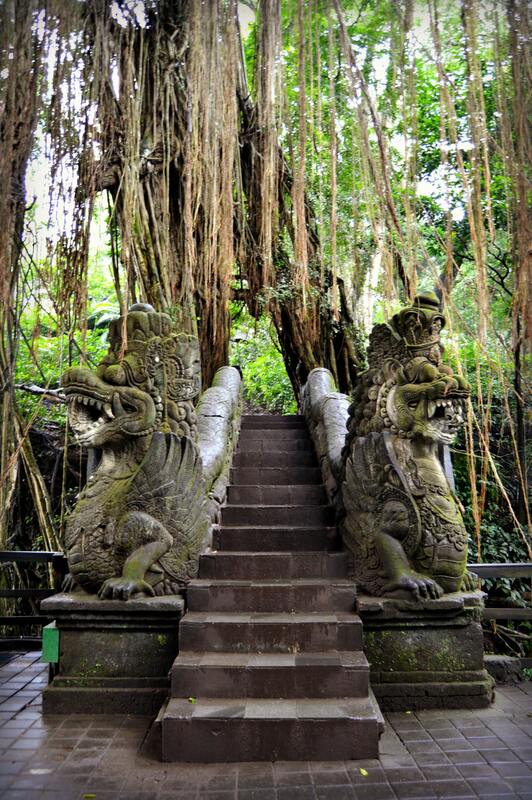 The capital is Jakarta on the neighboring island of Java directly to the west of Bali. 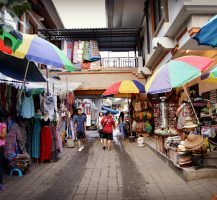 Indonesia is the 4th largest populous country in the world, with a predominately Muslims population, and people in Bali speak both Balinese and Indonesian. 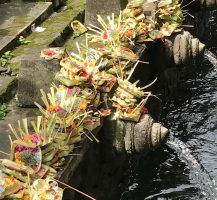 Bali, on the other hand, is Hindu with practices, celebrations, offerings, blessings and many other traditions honoring and protecting the culture. 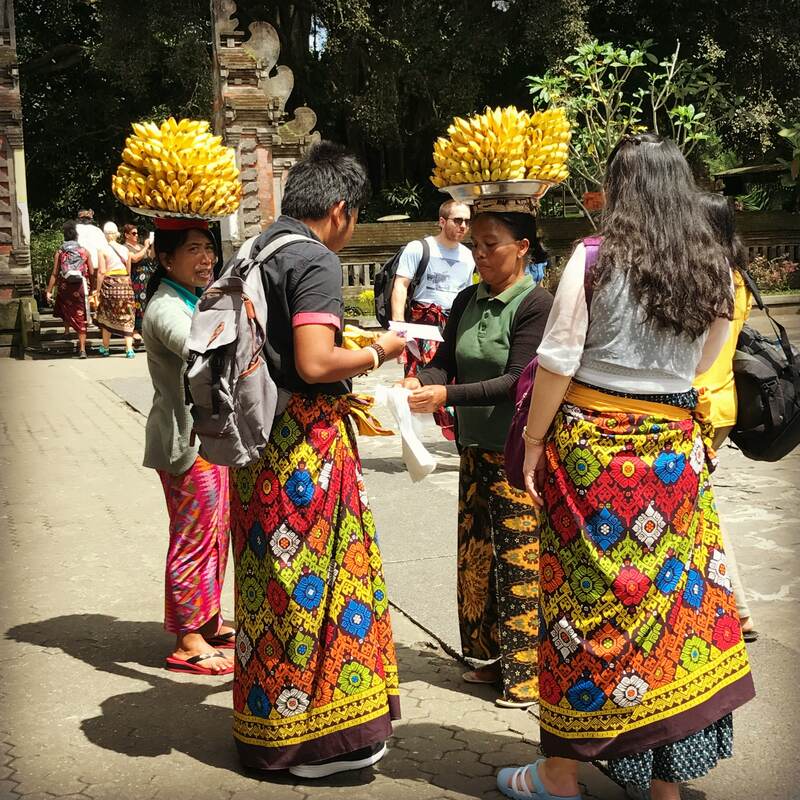 There were handmade decorations and offerings outside of temples, homes, and businesses everywhere we went. These are part of daily life. 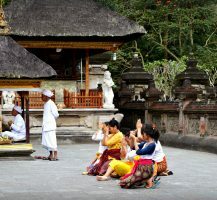 The Balinese are constantly celebrating something, expressing gratitude, and communing with the Gods through incense, daily offerings, flowers, rice and prayer. I’ve never seen a more grateful culture. 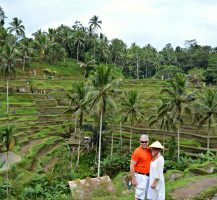 Here are some highlights from Ubud. Oh, how I really want to like these guys. First, I’m an animal lover-all of them. 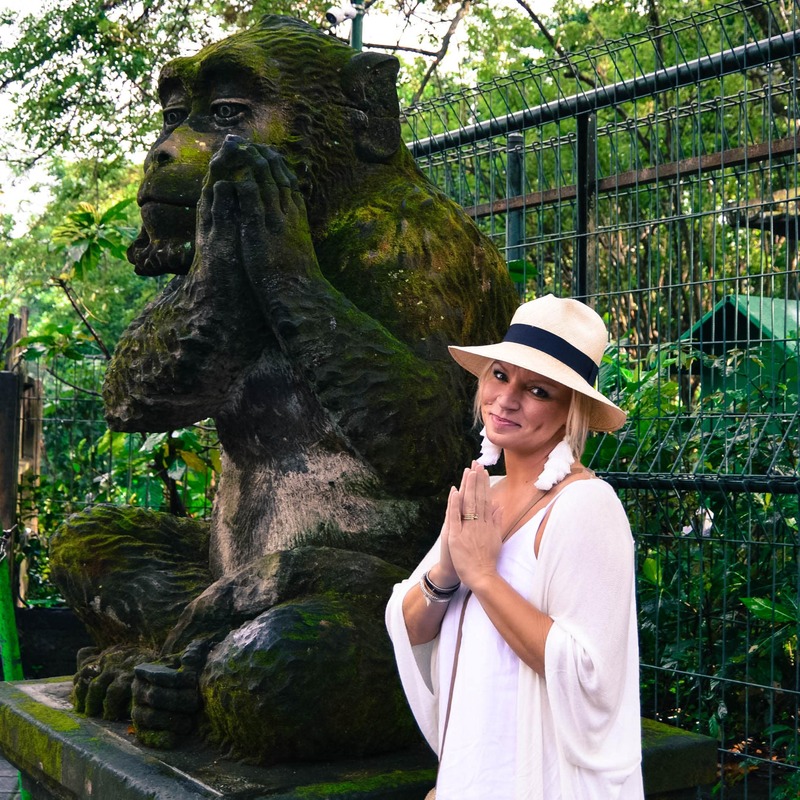 A fan of the macaque monkey, I am not. They are not cute, cuddly creatures. They are mean, aggressive, unpredictable, quick and strong. 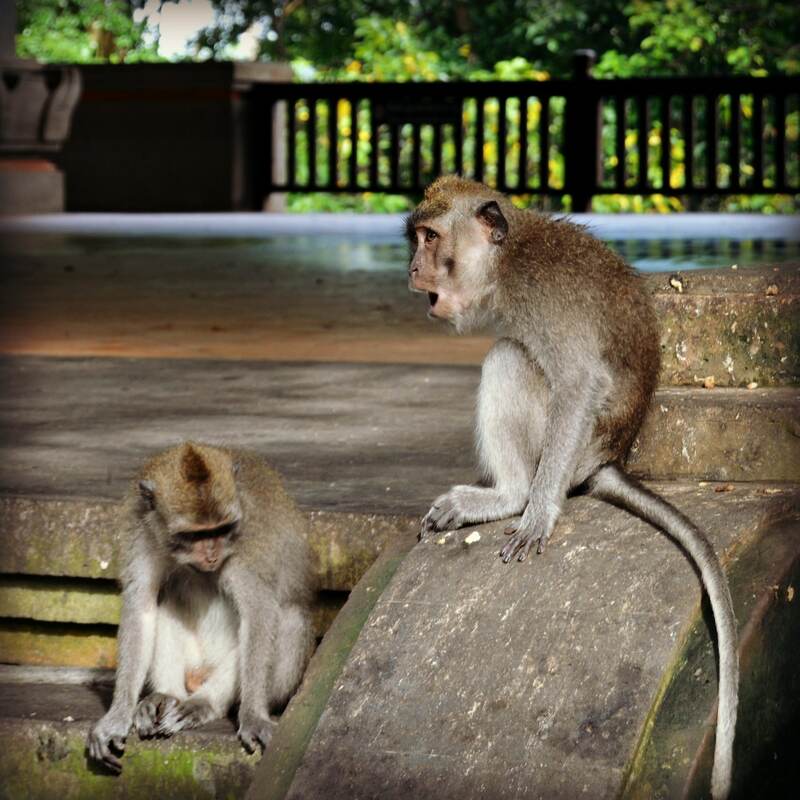 This was my second encounter with these monkeys, and it was just as unsettling. 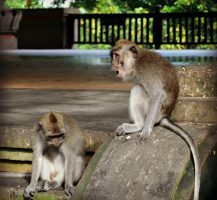 The first one was in Thailand, and the minute they saw us, they rushed onto our boat, creating complete and utter pandemonium looking for food. I learned my lesson then to keep my distance. 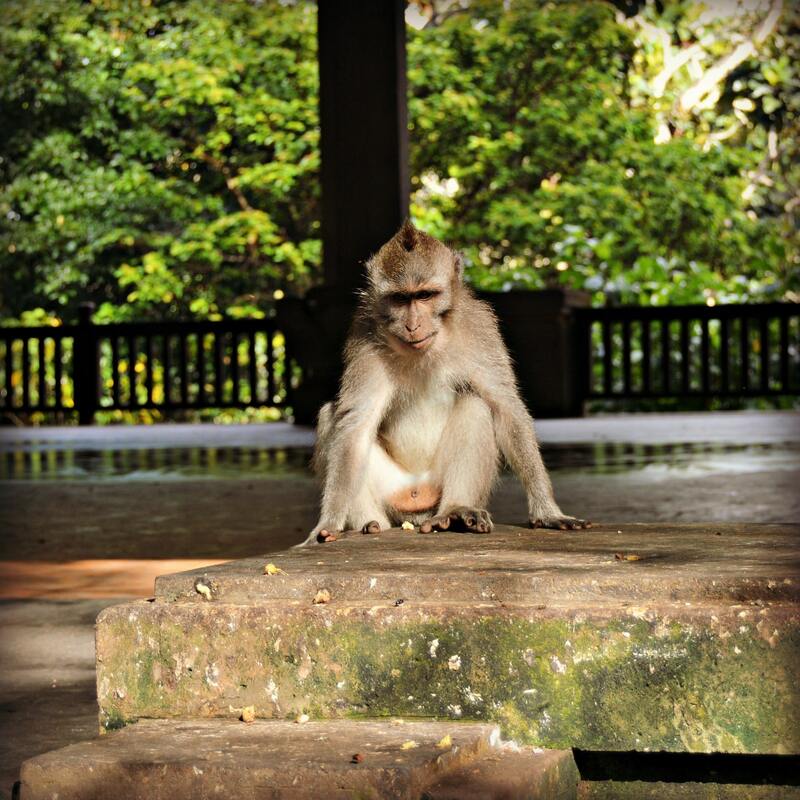 Before entering the forest, our guide told us not to look the monkeys in the eyes. They see it as a challenge and will come after you. 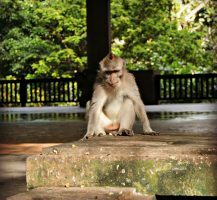 In fact, once inside the forest there were signs everywhere stating, “Do not make eye contact with the monkeys.” Ugh, these things freak me out, and rightly so. 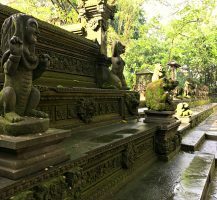 Our guide said not to let one jump on your head or shoulders, because they have scratched people’s eyes out before, and they are thieves, as well. Be sure you hold on to your sunglasses and phones. They are very curious, too. Do not underestimate the strength and speed of this tiny creature. So, a word to the wise: definitely go to the forest, but beware of this little monster. 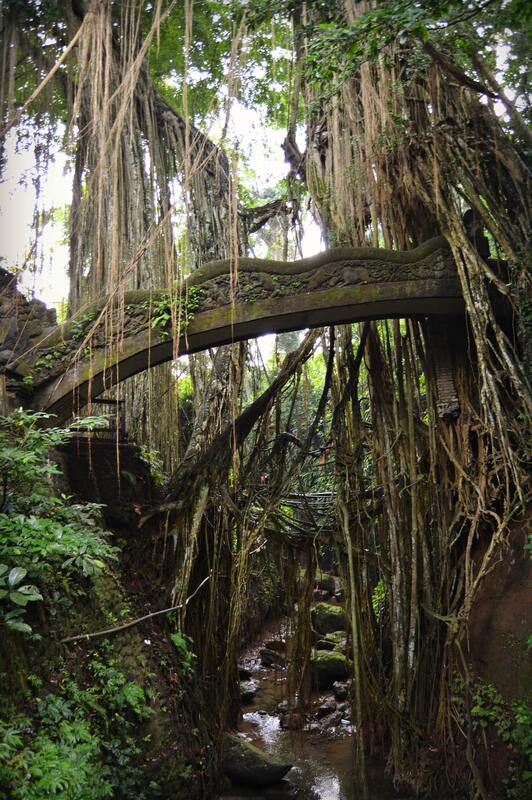 The forest itself is like something out of a storybook. 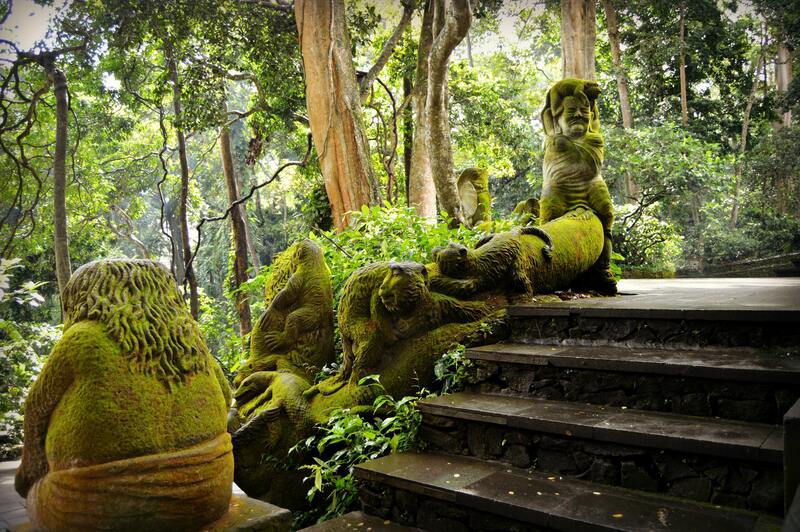 The trees, vines, plants, Naga (dragon) bridge made of stone, and moss covered statues are simply enchanting. 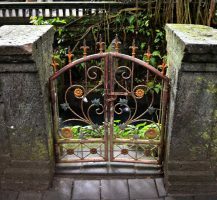 Try to go in the morning. Because of the light filtering through the trees in the morning, there is a misty light and spiritual quality in the forest. 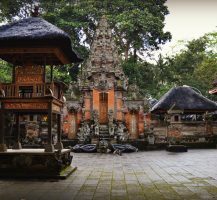 It’s a feeling you’ll find all over the island actually, thanks to incense burning everywhere, Balinese music, and offerings in front of nearly every building. 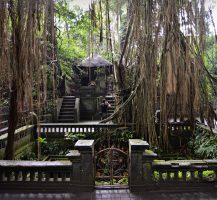 There are three temples inside the forest that are still used today. 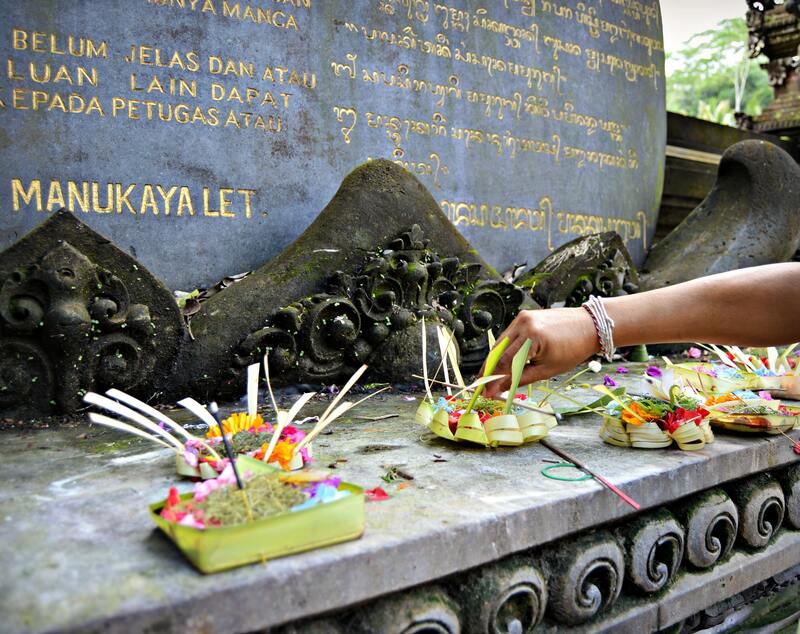 One for transformation, one for purification and spiritual cleansing, and one for cremation. 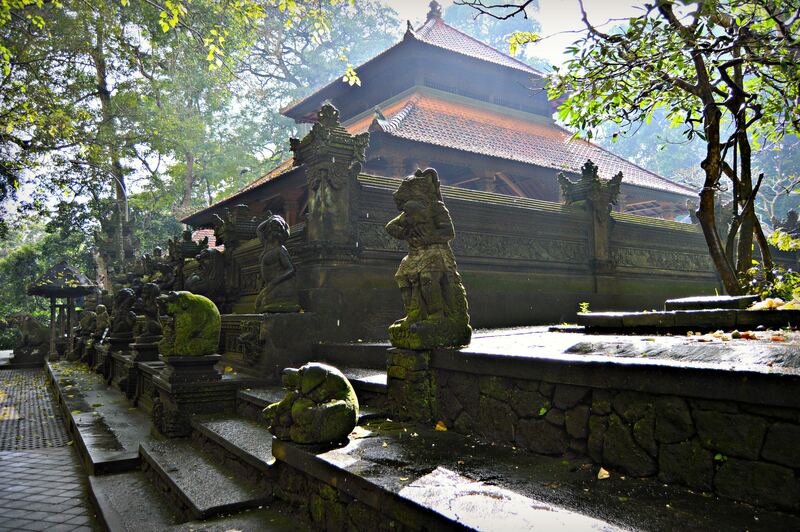 Many Hindus come here to pray to the Gods and a mass cremation is held every five years. 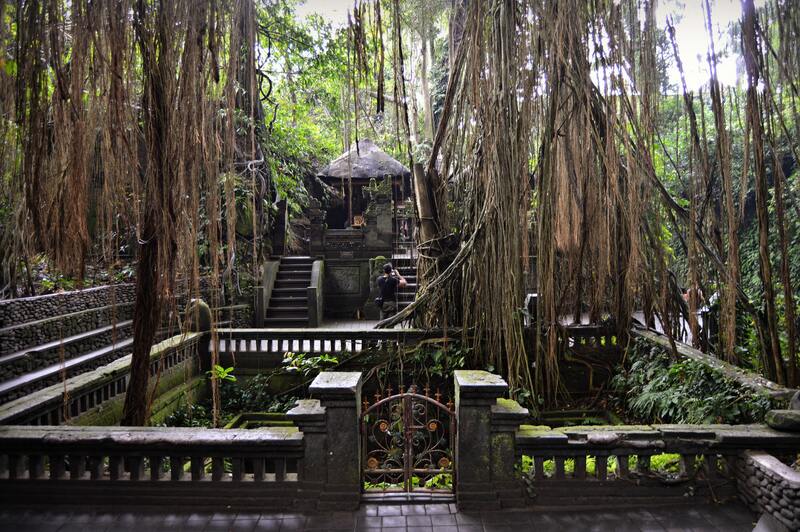 There is a cemetery in the forest which is temporarily used while families wait for the mass cremation. 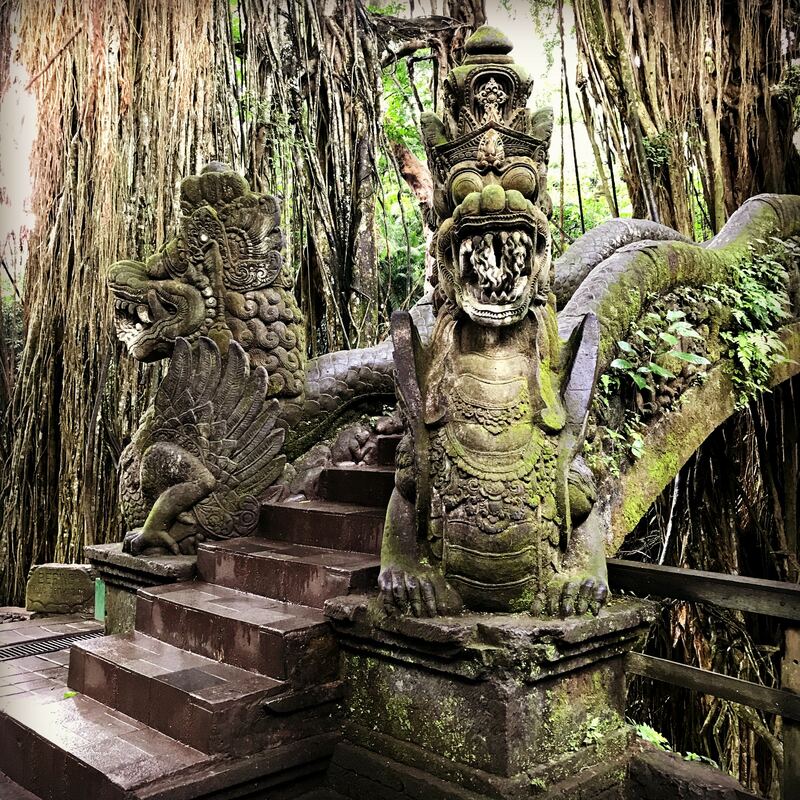 There are over 100 different species of trees in the forest, and many are used for Balinese spiritual practices. 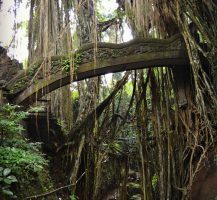 The banyan tree in the middle is over 400 years old and many trees in the forest are considered holy. 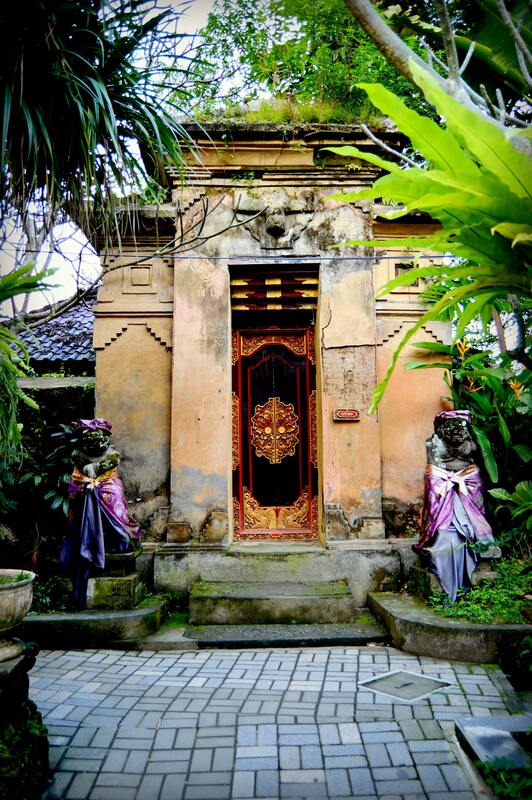 Balinese believe in maintaining harmony between humans, animals and nature, and the spirit world. 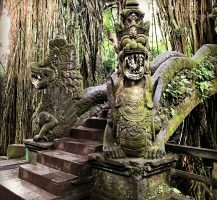 Leaves and branches from the trees are used for spiritual activities and mask making for ceremonies that take place in forest. 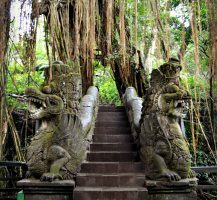 No trees are killed, and prior to cutting any parts of the tree, the priest will ask the tree spirit for permission to cut a small piece. 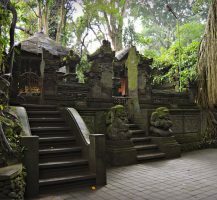 It’s a culture that respects nature and shows immense gratitude for even the smallest things, like leaves and trees. 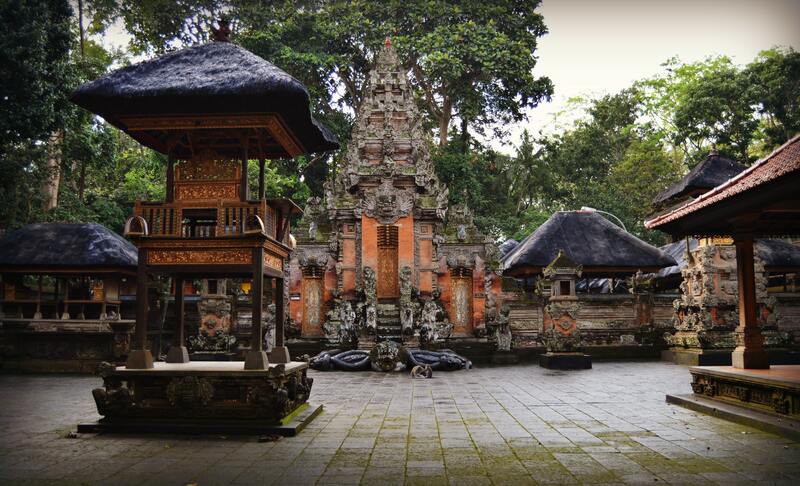 If you’ve seen pictures of Bali, you’ve probably seen Tegalalang. 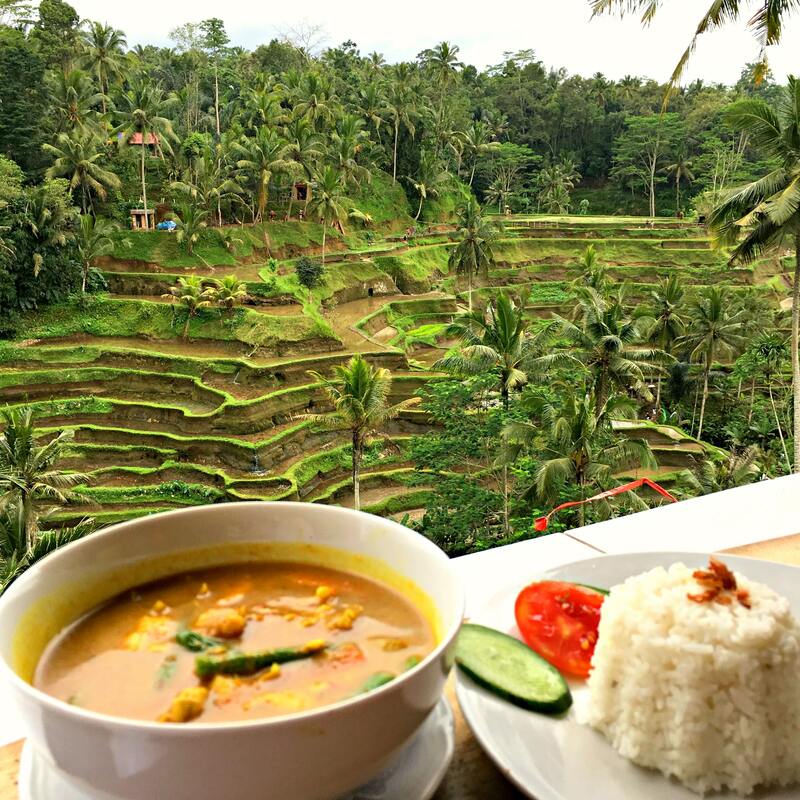 Any drive around Bali offers views of rice paddies and rice terraces that are simply gorgeous, but Tegalalang is unforgettable for it’s sheer size, depth and uninterrupted view. 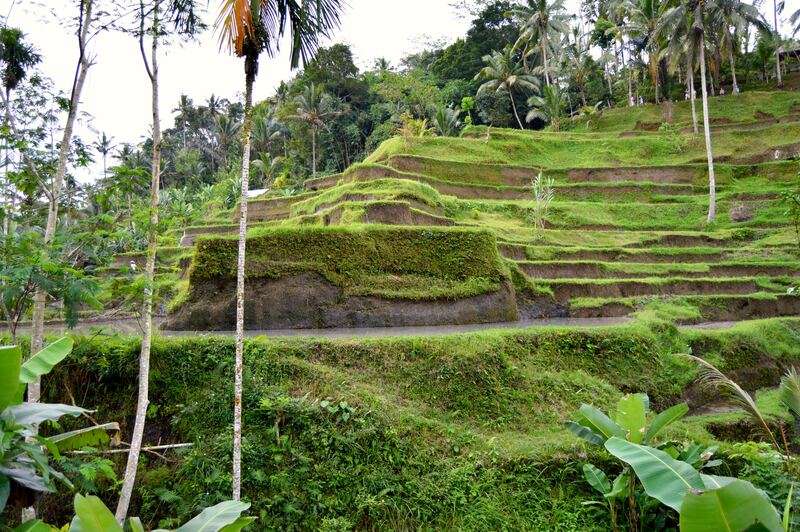 This undulating, terraced landscape maintains an irrigation system that has been handed down since the 8th century. 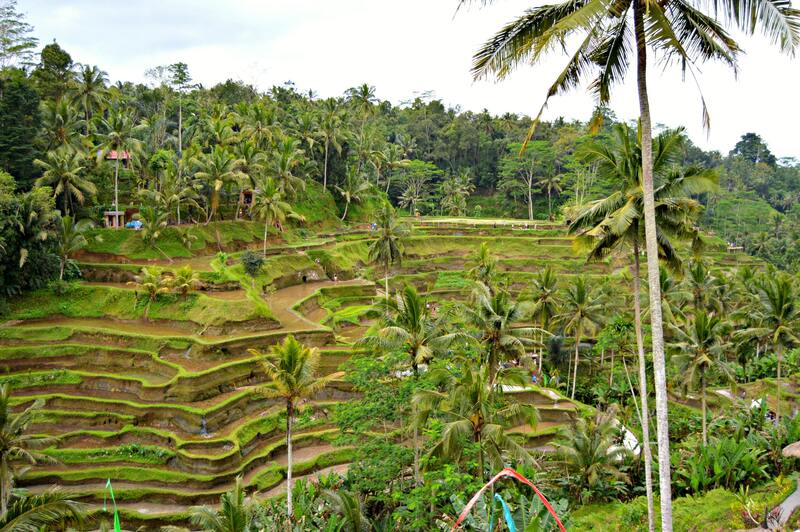 The panoramic views sweeping across and down into valley are breathtaking. 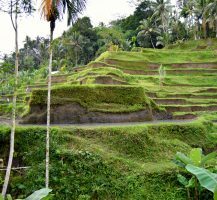 Farmers allow visitors to walk the terraces, which can be quite steep and slippery due the water irrigating the rice, and it’s quite common to see them working as you’re walking. Talk about back breaking work. 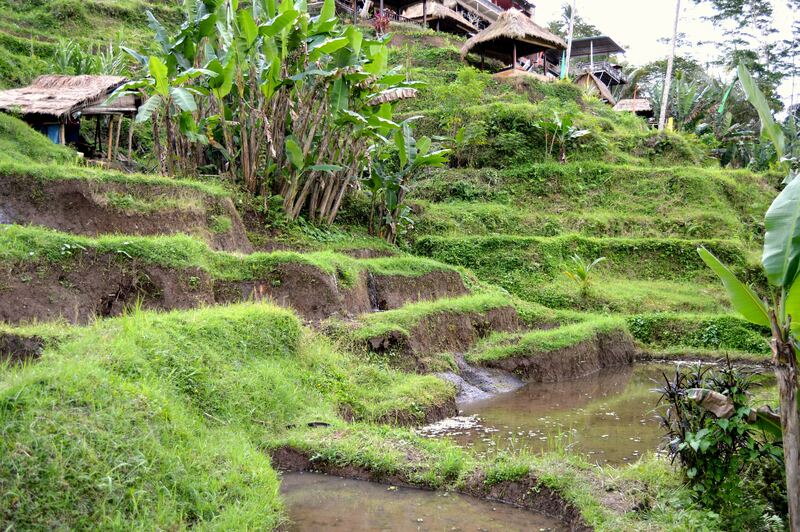 Most farmers spend their entire day bent over, barefoot, in shin deep water. 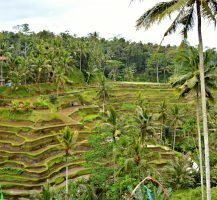 Once you see how many rice fields and terraces there are in Bali, it’s surprising to learn they still don’t produce enough rice and have to rely on imported rice to support their need. 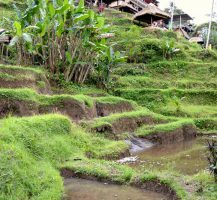 There is a bridge at the bottom to walk across to the other side of the valley, and restaurants and markets line the top with open-air dining overlooking Tegalalang. 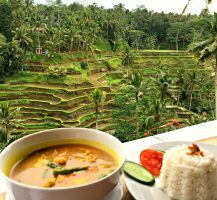 I had this wonderful curry and rice dish for lunch and this priceless view. The sky was covered in clouds, so I can’t imagine how green it is on a sunny day. 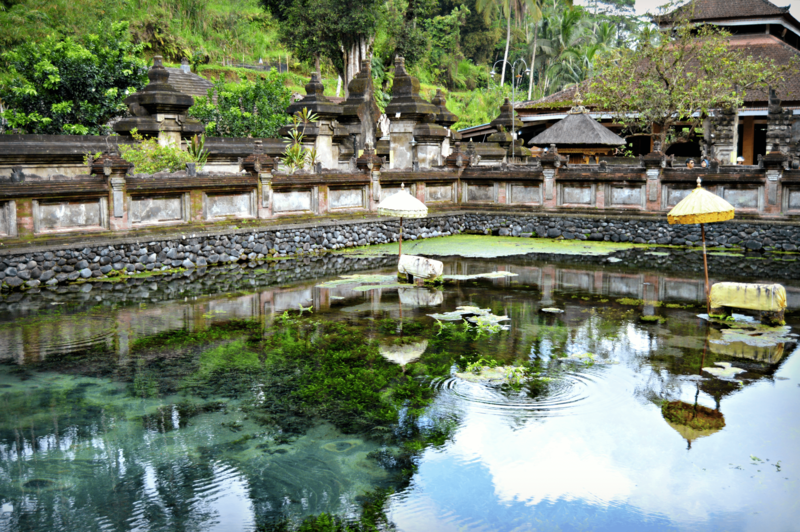 By far, the most fascinating place I have been in the world is Titra Empul. This Hindu water temple is fed by the sacred waters of an underground spring found around 900 A.D. 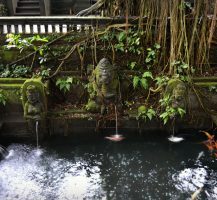 The water from the spring is collected in a pond and flows through 30 fountains, all representing different aspects of life. 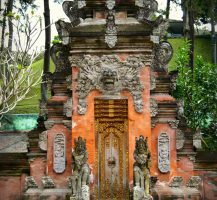 Balinese come to this temple to cleanse and purify their mind, body and spirit and perform ceremonial rituals at each fountain. 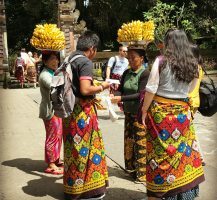 Outside the temple you purchase an offerings basket with flowers, rice, and incense, and a sarong to wear, if you don’t have one. I highly recommend you bring your own. 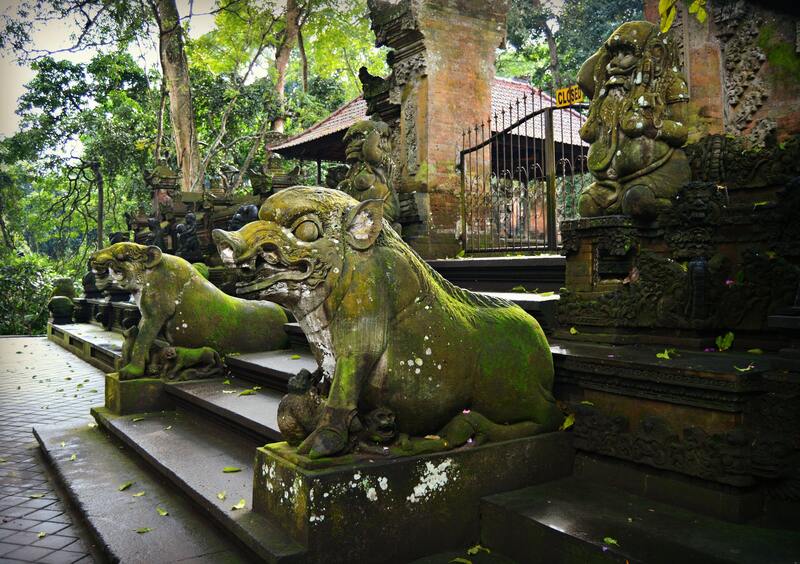 They are all over Bali and all sacred sites require them. You don’t want to wrap yourself in a wet sarong someone just took off after getting out of the pools. 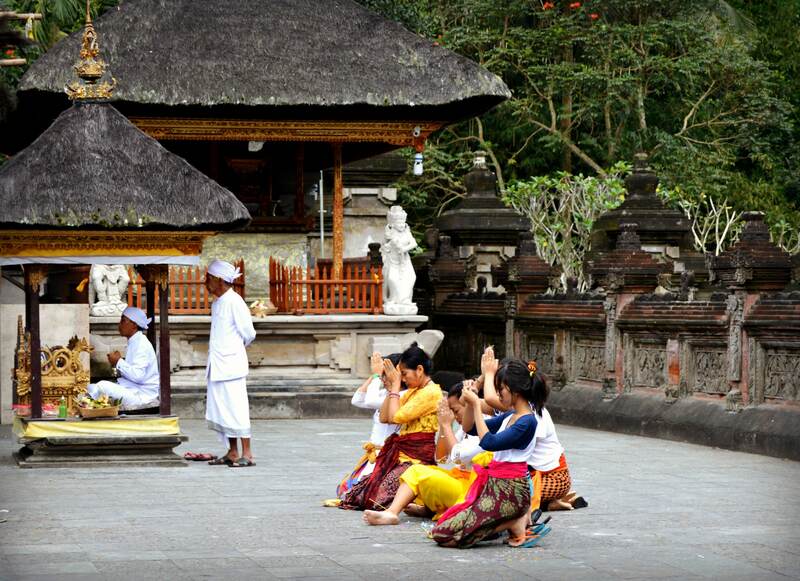 Sarongs are required for everyone entering a temple in Bali (including men). 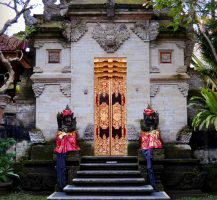 Our guide explained, Balinese believe the lower portion of the body (the legs) to be unclean and should be covered at all times in holy places. 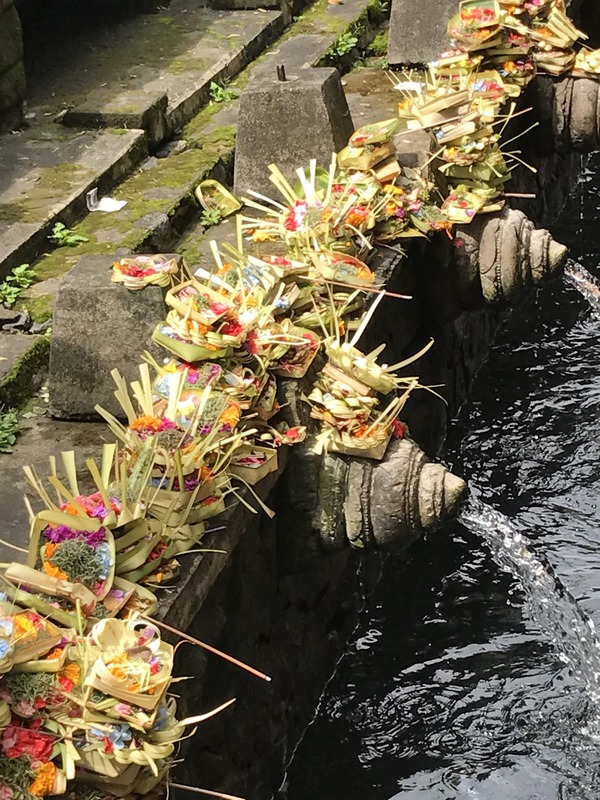 Before entering the water, you sit across from the altar on a platform with others and follow along as you are led through a Hindu blessing. 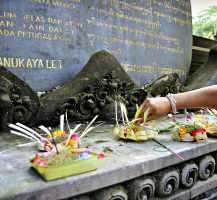 As the incense are burning, you place different colored flowers from your offerings basket in the tips of your fingers as you pray, behind your ears, on top of your head, and rice on your forehead at different points during the blessing. 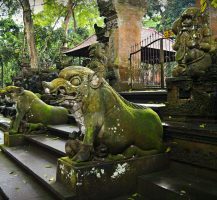 Each represent different things and different offerings to the Gods. 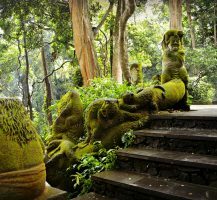 The Gods are Brahma (the creator), Vishnu (the preserver) and Shiva (the destroyer). 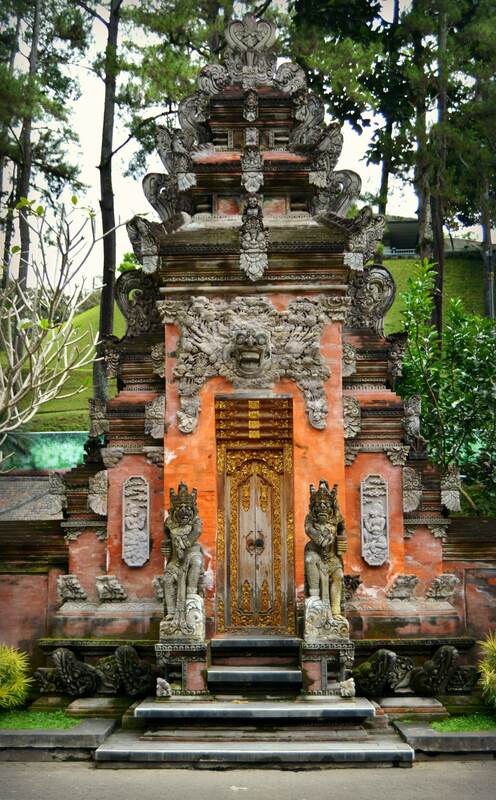 They represent the trinity and the cosmic functions of creation, maintenance and destruction in Hinduism. 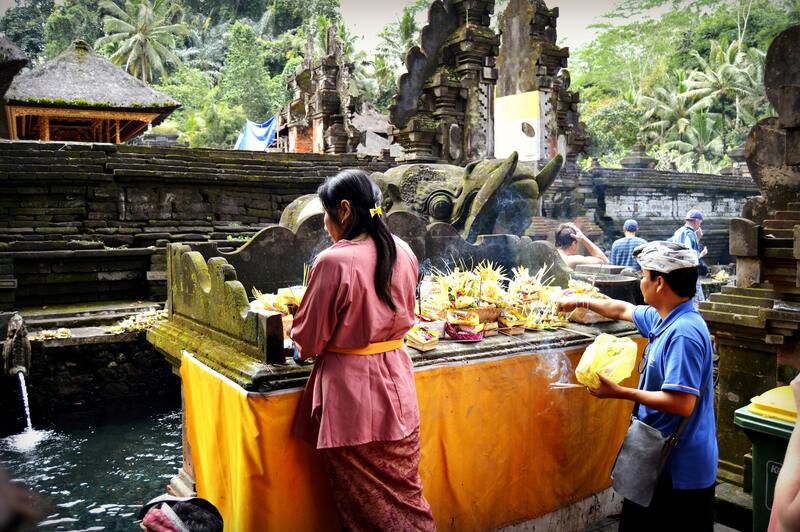 After the blessing, you place your offerings basket on the altar and make your way to the pools and fountains. The water is freezing, the bottom is pebbly (no shoes are allowed in the water), and it took me several minutes to get over the fish swimming around. 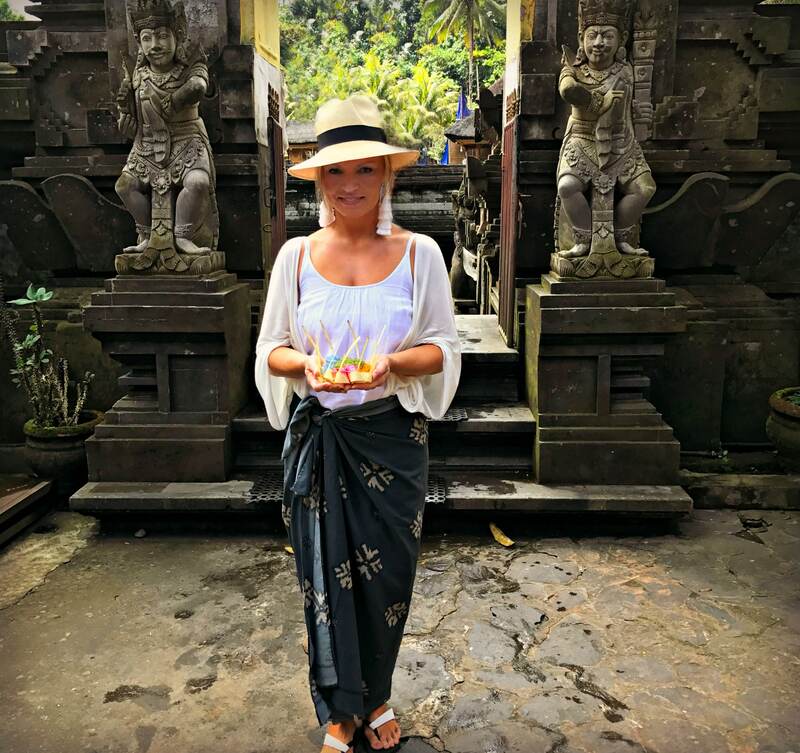 The tickling feeling on my legs every time my sarong brushed my legs as it floated around in the water had me freaked out the fish were biting me. Uneasy we all entered the water having no idea if we were doing any of it right, shivering, and trying to walk as softly as possible on the rocks so we didn’t hurt our feet. 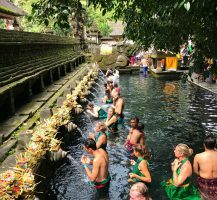 The water is crystal clear and really beautiful with all the flowers blowing in it from the offerings baskets placed over the fountains. 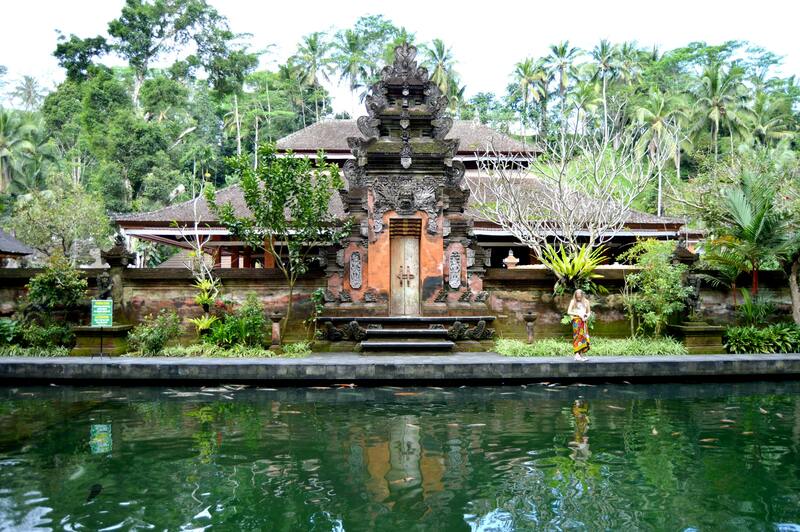 There are several pools with a number of fountains in each. 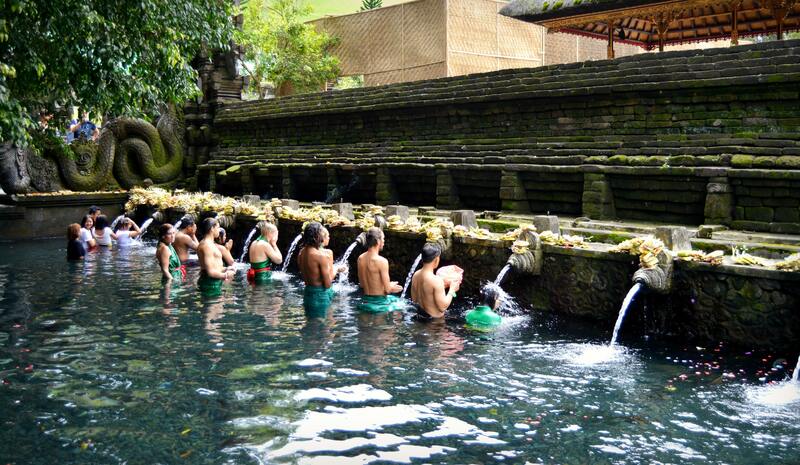 You progress down the line repeating the ritual at each fountain. There are certain fountains you skip, and although our guide tried to give us all the instructions before we got in, it was a lot to take in and remember, and there were too many fountains, too many gods and too many things to remember to do. Haha. 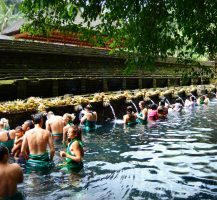 I was first in the water, and thankfully, in front of me was a local Hindu couple whispering to me which fountains we were supposed to skip. 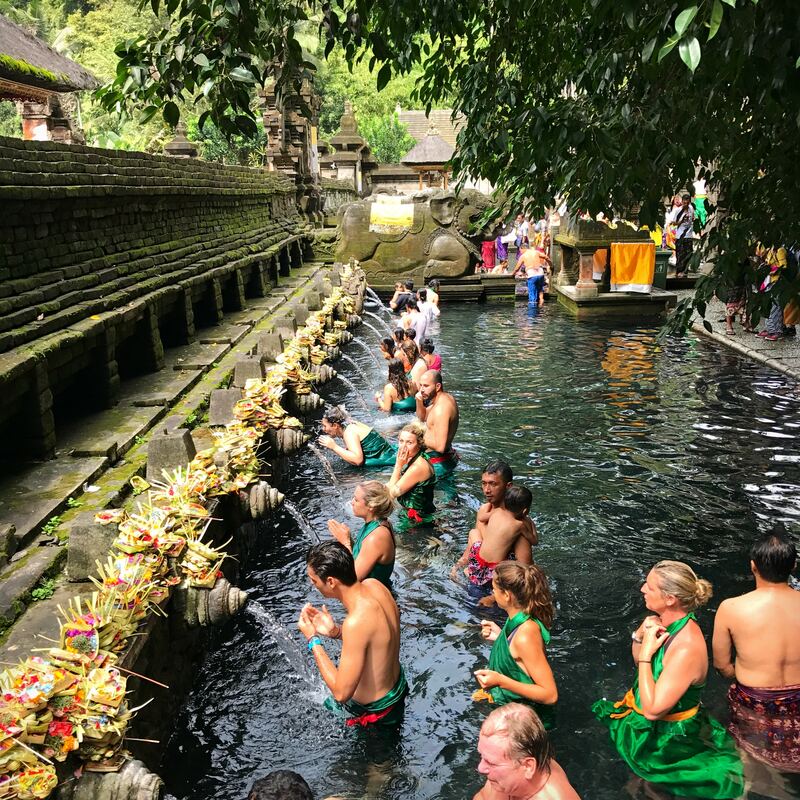 The first fountain in the pool is for the local villagers only, there were two fountains for deceased and a few others skipped for various reasons. We quietly laughed at ourselves as we waited to get to the first fountain and reviewed with each other what we were supposed to do. Do we splash our face first, pray first, drink first or dunk our heads first? Again, thankful for our Hindu neighbors in the line in front of us, we followed along carefully. They could tell we were trying really hard and were being as respectful as we could and wanted to learn. First, you stand in front of the fountain. You place your hands in prayer, thumbs at your third eye and say a prayer. You splash your face three times with water, then cup your hands and take three sips of water. Lastly you drop down under the fountain and dunk your head allowing the water to wash over you, rinsing and purifying you. 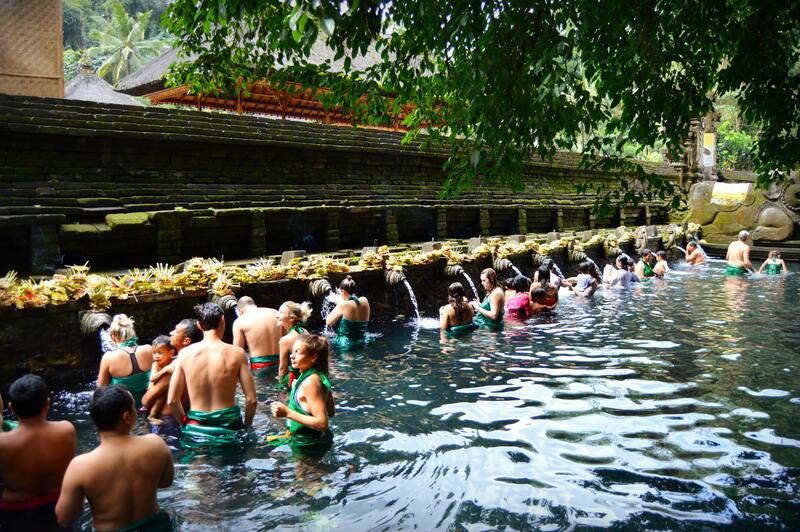 Once finished, you move to the fountain to your right until you have finished all the fountains in all the pools. Did I mention how cold the water is? Ughhh! 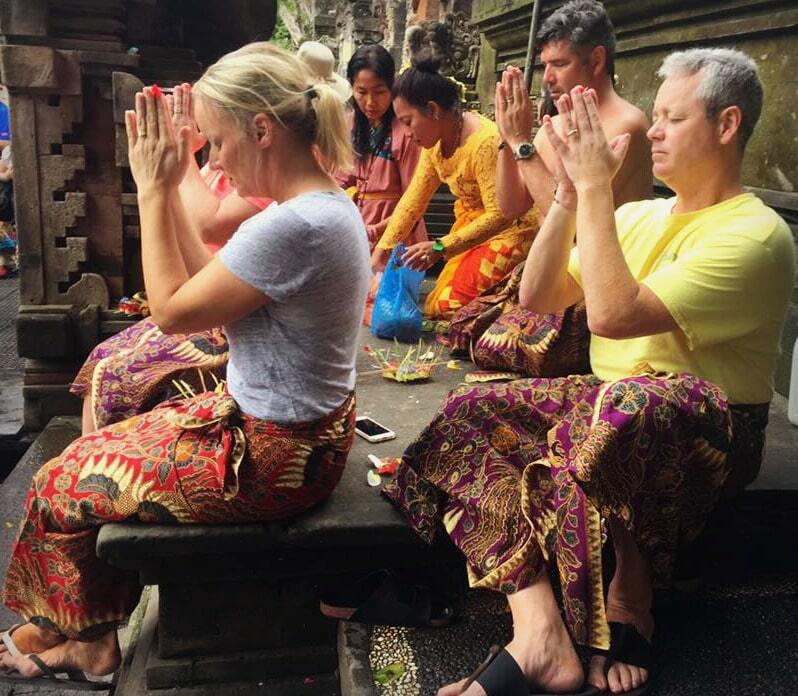 Although we aren’t Hindu, there is a personal moment of reflection and private prayer at each fountain for yourself. 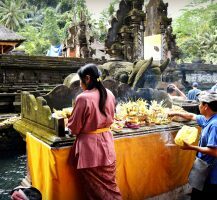 All of the symbolic gestures of the rituals can be viewed anyway you like, based on your own religion and intention for the experience. 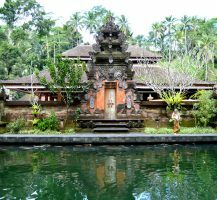 It was highly spiritual day for us, and we saw all faiths and people in the water that day. 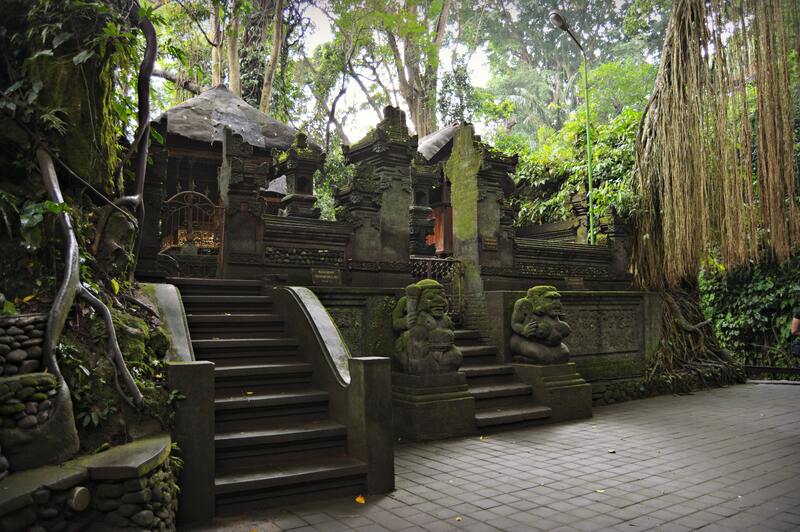 The outer courtyard and inner courtyards of the temple are beautiful. 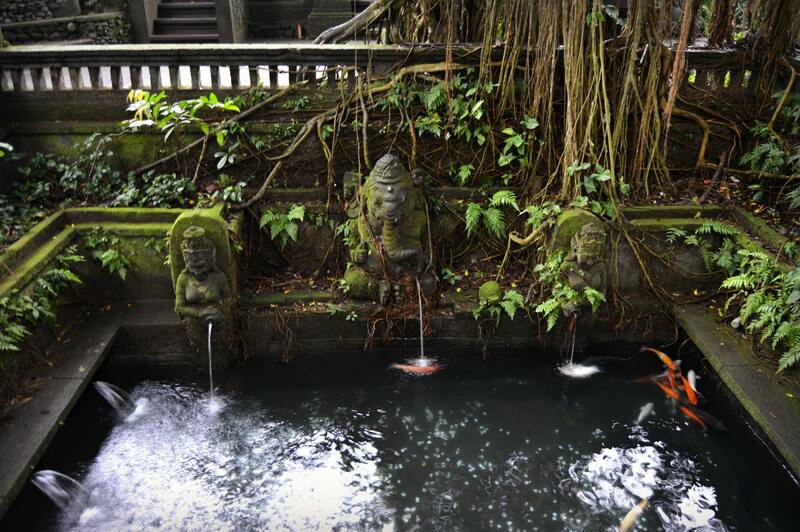 There are several pools throughout with koi and statues, and trees line the grounds around the temple. It’s a deeply spiritual and beautiful experience. 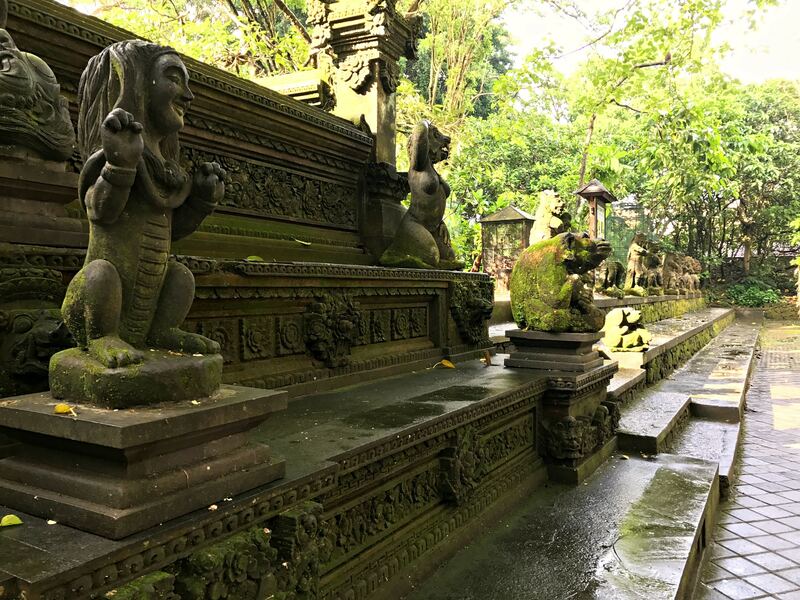 The inner courtyard is only for those of the Hindu faith, but you do get to see the pool where the spring water is contained as it flows up from the ground, before running through the fountains. The offerings baskets pictured above are everywhere, and in a future blog, I’ll show you how they are made. 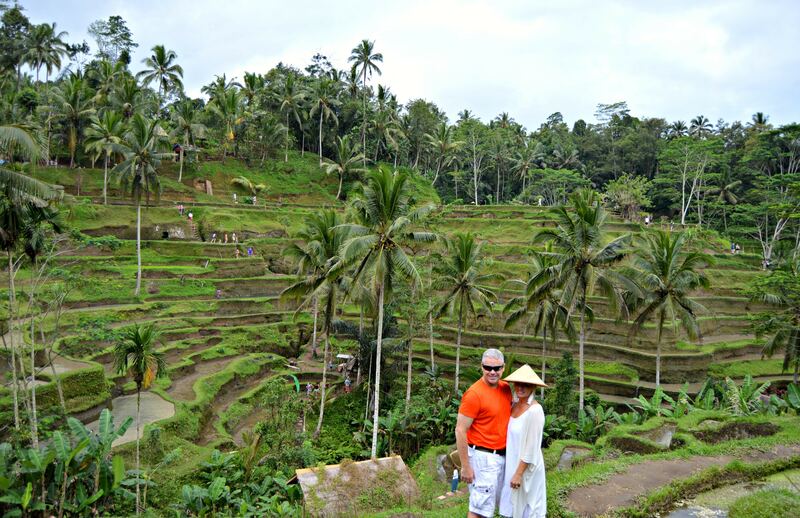 There are two other places worth mentioning, Ubud Palace and Ubud Market. 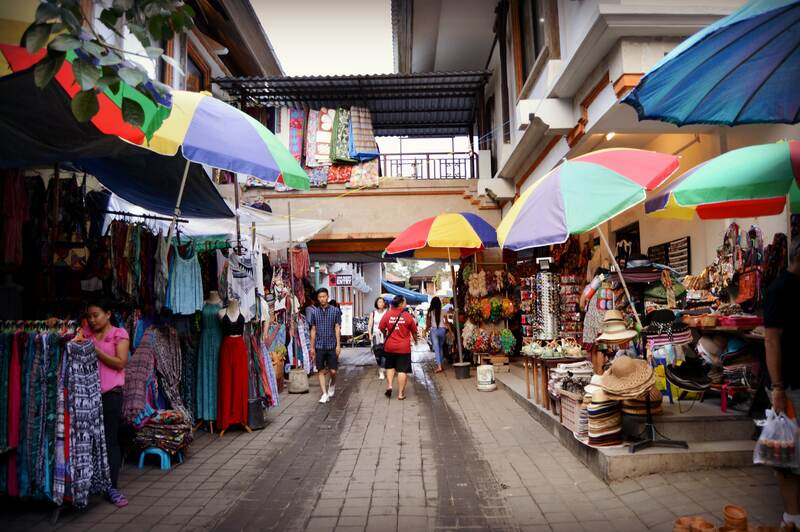 Both are within walking distance from each other and if you’ve seen Eat Pray Love, you’ll remember the market scene. 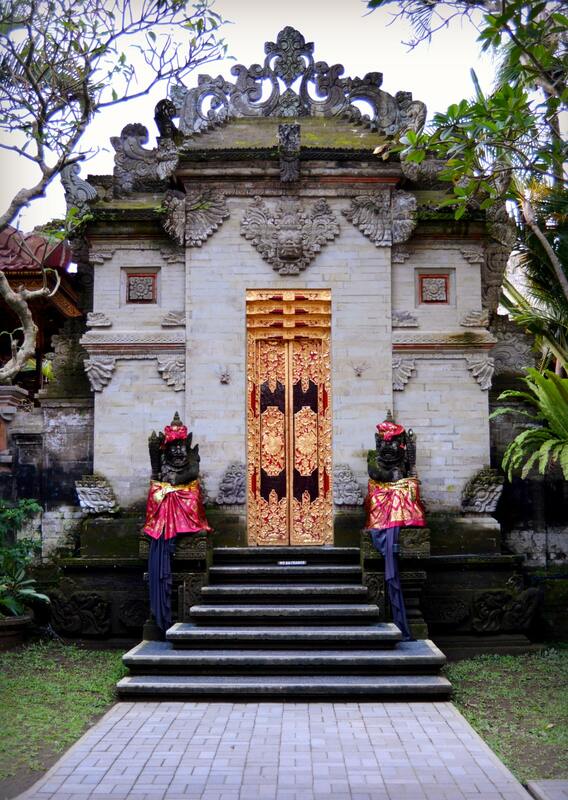 You will also see in a later blog post how the hotel we stayed at in Seminyak used the doors at Ubud Palace (pictured below) for inspiration in their design. Thanks so much for reading! 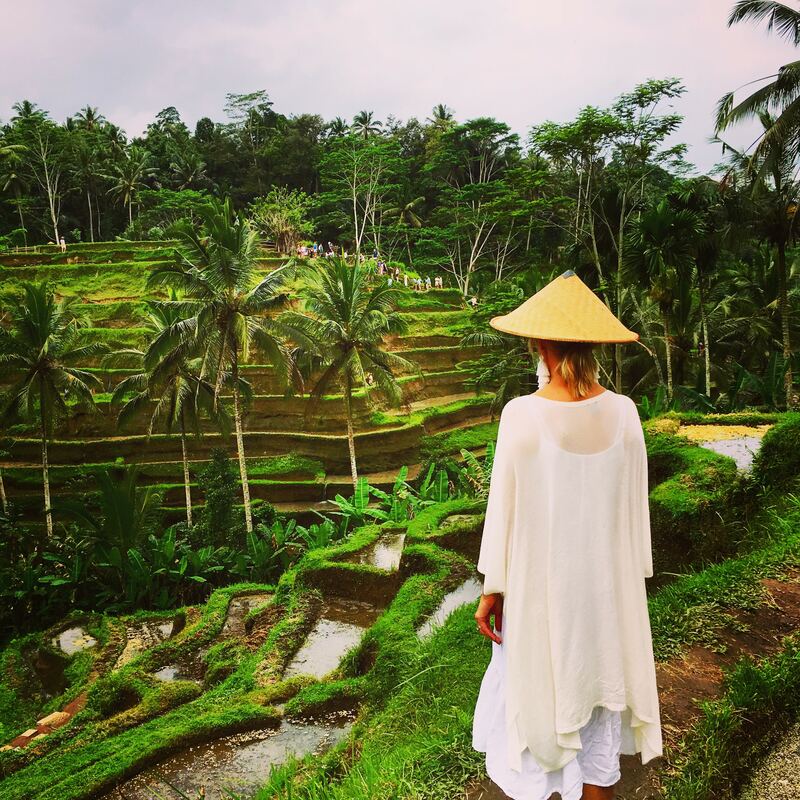 I hope you get to Bali at some point. 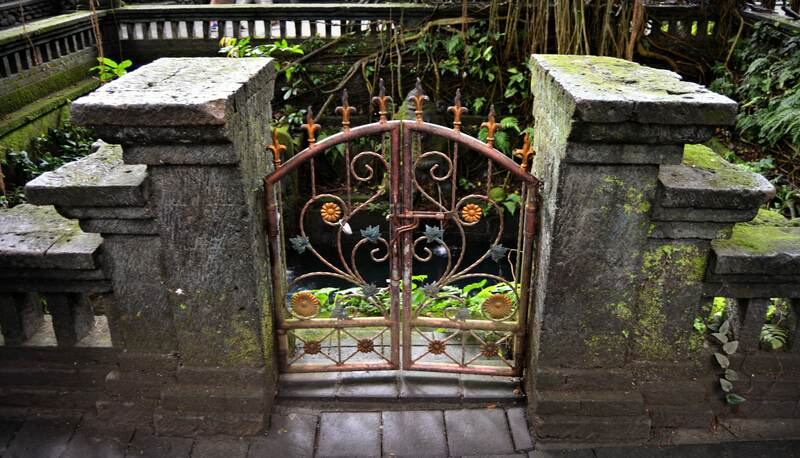 It’s worth visit.